The son of James John Roughton, he was considered a bit of an eccentric. 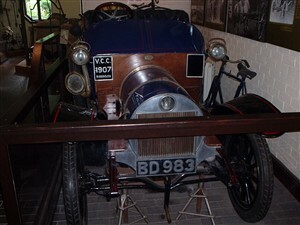 He is reputed to have used the back shelf of the Robinson motor car for carrying out minor operations. Interesting to see the Robinson Roughton car at the Manor House Museum. My family, the 'Yorks' are related to the Roughtons, albeit distantly. I visited Kettering last week after a gap of some thirty years. Couldn't remember a lot, but the visit was worthwhile.